The 60th wedding anniversary of a couple is the biggest milestone they can reach. So diamonds is the theme of this event. Get gifts like a diamond ring or pendant for your wife. 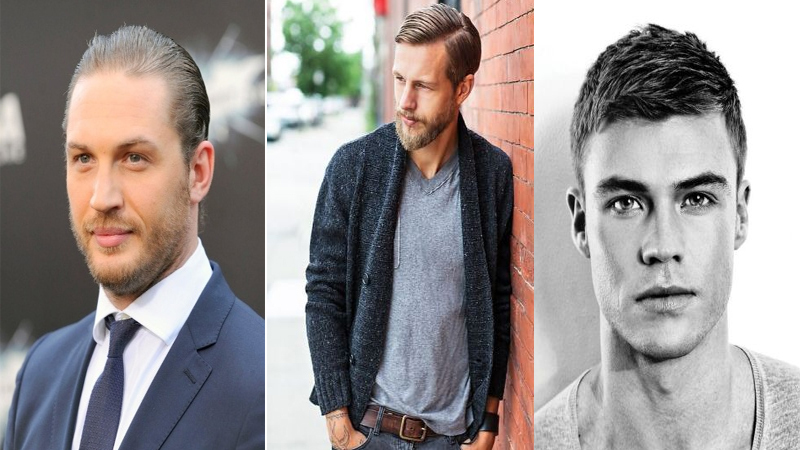 For the husband, you can get amazing mugs, cards, photo frame, etc. Let’s see the 9 best gifts for 60th wedding anniversary which you can give to your loved ones for 2018. 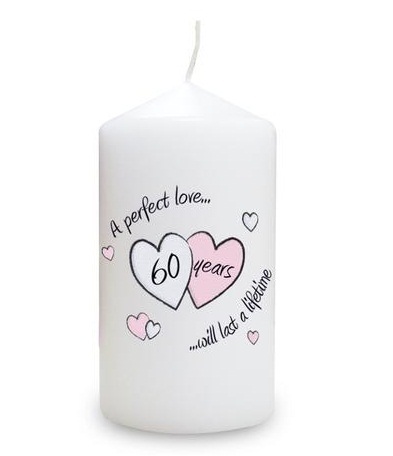 This is a lovely 60th anniversary gift that you can give the couple. 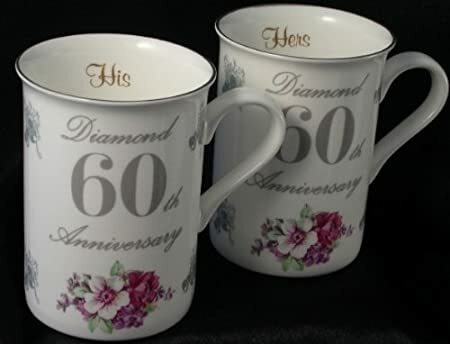 The anniversary pair of white colored mugs has the number 60 printed in bold. You can have floral decorations done on the mug too. Get this mugs by e-commerce store, you will get good options for personalize. Enter the love notes for your spouse on a gorgeous handmade paper. These notes can be printed or handwritten as well. Decorate the card with lovely filigree work or hearts. The 60th wedding anniversary card is a wonderful gift to give. Get this one for your dear one. This is an amazing gift that you can give your spouse on the anniversary. It shows the way your family has grown from just the two of you. 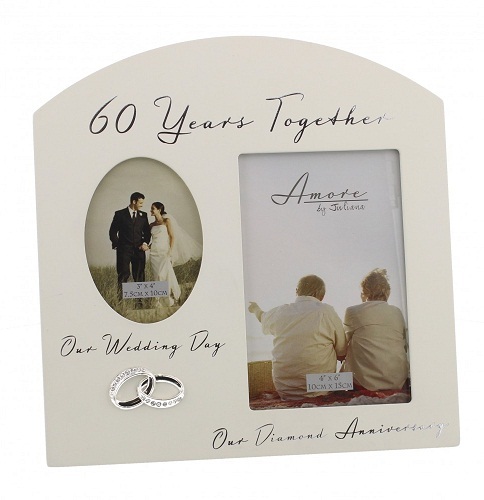 The frame is the best 60th wedding anniversary gift to present your spouse. 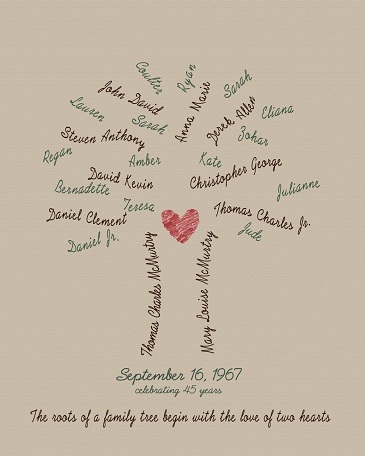 You can personalize this with a photo of your all family members; get this gift to surprise your spouse. Another cool idea to give on the anniversary is this double wooden photo frame. You need to place a wedding photo in one and the other will have your latest photo together. This makes a great 60th anniversary gift for anyone. This one gift will be a good choice to make a memory of your old and current photos. 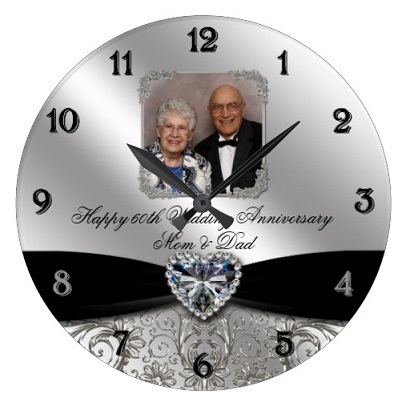 Try this wonderful 60 wedding anniversary photo wall clock that you can give as a keepsake. The wall clock is printed with wishes for the anniversary. You can add in that the latest photo of the couple as well. 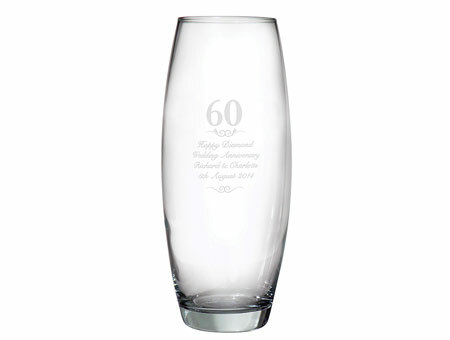 Kids can gift this gift to their grandparents on their 60th wedding anniversary day. Gift something sweet on the diamond wedding anniversary of the couple. This stunning cake with white decorations is decadent. 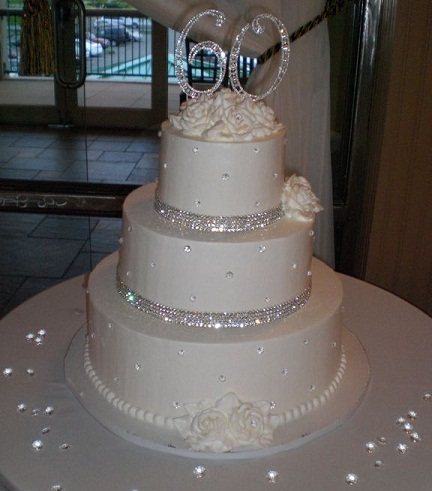 The diamond decorations on the cake look beautiful as well. This makes a wonderful 60th wedding anniversary gift ideas. This one is outstanding cake for your parent’s 60th wedding anniversary evening celebration. Gift your wife this gorgeous diamond ring for the 60th anniversary. 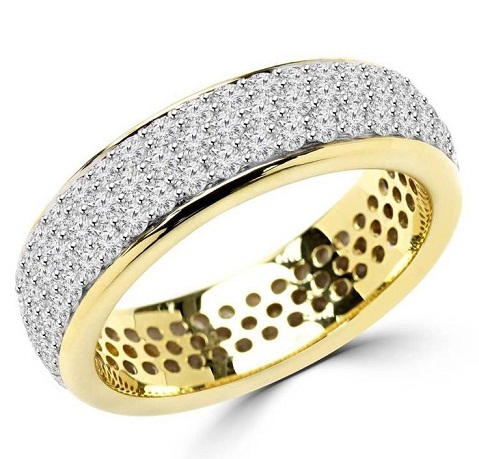 This diamond studded ring has several little diamonds in a gold base. The ring is by far the best 60 year anniversary gift you can give your wife. 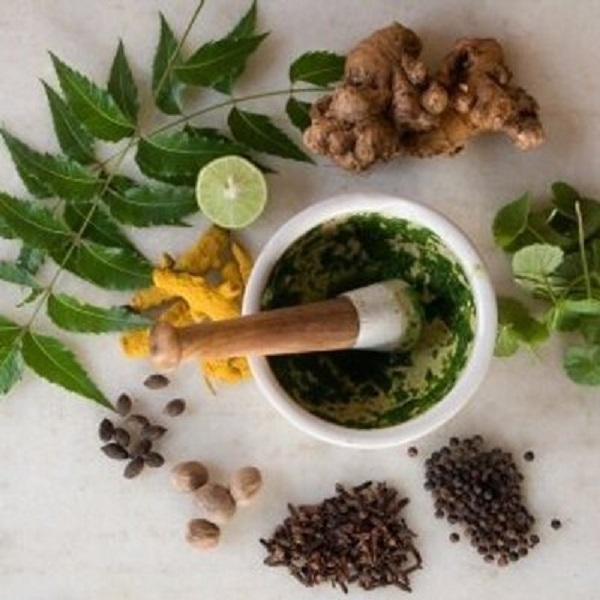 If you want to really give your best as a gift then surely get this gift for your wife. 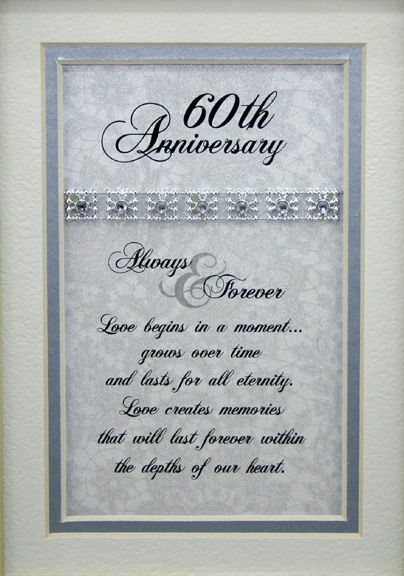 Try this diamond wedding anniversary gift that is personalized. The candle has little hearts in the center and the wishes printed on the sides. You can get this as a 60th anniversary gift ideas. This bullet shaped vase is a perfect anniversary gift for your spouse. 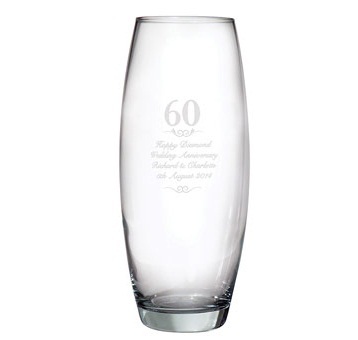 You can get it personalized by engraving the vase with wishes for the couple. The glass vase looks great as is and can be wrapped in a lovely box. The 60th anniversary is a milestone event that is also known as the diamond anniversary. The diamond represents the sign of love; it helps to give you a special treatment in love. So here you can give your spouse something that is made of diamonds too. 20 Mesmerizing Yellow Sarees To Make You Look Bright!